2. Add the onions and saute till light brown. 3. Add the ground paste and salt. 5. Add the tomatoes and mix well. 6. Add the jaggery and cook on low heat till the mixture is dry. 7. Remove and transfer the contents into an ovenproof dish. 8. Beat the egg whites till frothy. 9. Add the yolks and beat again. 10. Pour this over the tomato mixture and bake in a preheated oven (200C/400F) till the eggs are firm to the touch. 11. Remove and serve with bread. 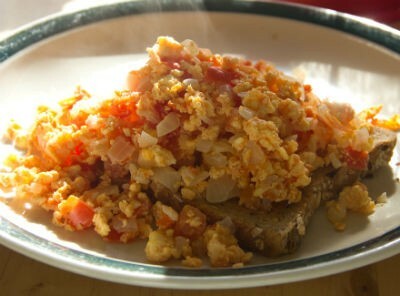 Feel free to comment or share your thoughts on this Tamata Pereeda (Eggs on Tomato) Recipe from Awesome Cuisine.